This layer enhances the bed’s support system with an added level of support where your body needs it most. 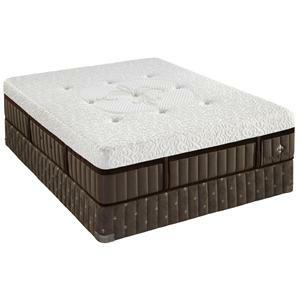 The MS Tompkins SPT Full Plush Super Pillow Top Pocketed Coil Mattress and 9" Steel Boxspring by Serta at Adcock Furniture in the Athens, Bogart, Watkinsville, Lawerenceville, Gainesville, Georgia area. Product availability may vary. Contact us for the most current availability on this product. 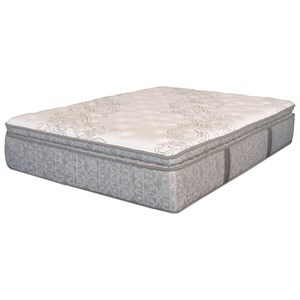 500964499-5030 Full 9" Steel Boxspring 1 9"
The Serta Majestic Sleep Collection Tompkins Super Pillow Top, is a pocketed coil mattress designed with up to 30% more steel to react to every contour of your body giving you the support to keep your body aligned so you feel comfortable all night and wake up fresh. The layer of Gel Active™ Gel Memory Foam helps you sleep cooler as well as reduces pressure points allowing you to sleep longer. Flex Band™ Memory Foam is added to enhance the bed’s support system with an added level of support where your body needs it most. 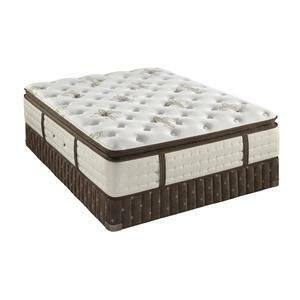 A Quality Mattress from a brand you trust. This is a very good mattress for back sleeper who prefers a softer feel or a side sleeper. The MS Tompkins SPT collection is a great option if you are looking for Mattresses in the Athens, Bogart, Watkinsville, Lawerenceville, Gainesville, Georgia area. Browse other items in the MS Tompkins SPT collection from Adcock Furniture in the Athens, Bogart, Watkinsville, Lawerenceville, Gainesville, Georgia area.